It seems every time I make fresh pasta, I use a different recipe. With different proportions. A different procedure. Occasionally there’s a bright color, such as beet or spinach. Sometimes different flours. 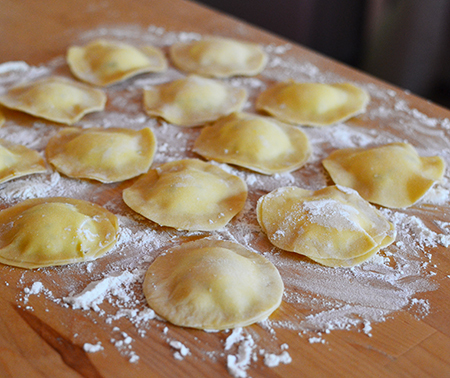 But, when making ravioli, the type of pasta doesn't mean as much to me as the stuff that's on the inside. 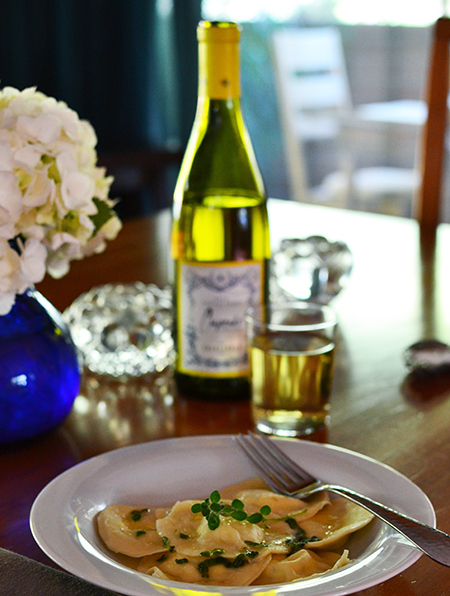 The filling makes the ravioli. The first way is something you have seen here on Cocoa & Lavender quite often: the quality of your ingredients matter. They define the end product. 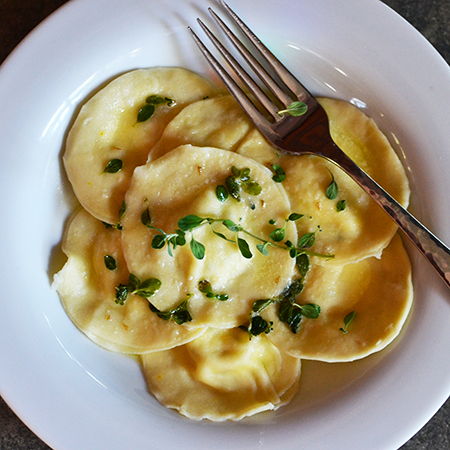 If you buy artisanal cheese, your ravioli will be a work of art. If you use fresh herbs, you will be able to taste the garden in which they were grown. The second way – balance – is also key. If your filling is too wet, you run the risk of making the pasta soggy. If it is too dry, you can end up with mealy pillows of sawdust. There is the flavor balance. For example, too much of an herb can be bitter. The saying is true: less is more. Another aspect of balance lies in the pairing flavors. Respect the integrity of your ingredients. If your filling is comprised of delicate flavors - fresh cheeses, for example - be gentle with herbs and spices. If robust - perhaps duck confit or wild mushrooms - you can be a little more aggressive with the add ins. 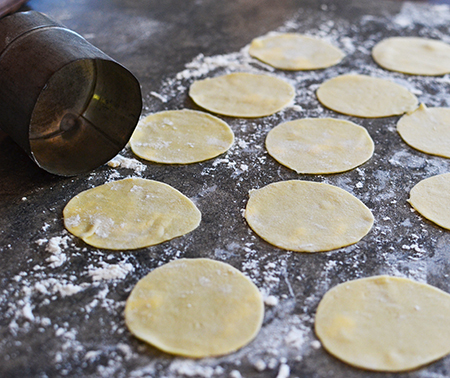 For a 2 1/2-inch to 3-inch raviolo, you need only a rounded teaspoon of filling. I know you want more in there, but you will only regret it when all your hard work breaks into smithereens when it hits the boiling water. Again, less is more. In fact, that applies to boiling too; don’t. Cook at a rapid simmer not a full boil! Today's recipe follows all my rules. 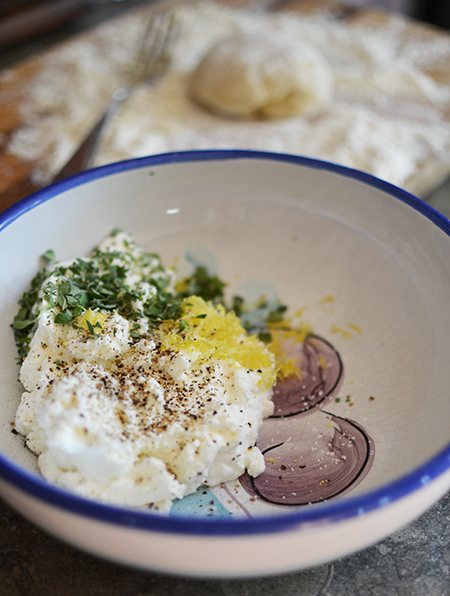 I used locally-made goat ricotta from Fiore diCapra (one of our local goat cheese artisans), a little fresh marjoram from our garden, and the zest of an organic lemon. I used Parmigiano Reggiano that wasn't local, but I used the best I could buy. And when I stuffed them, I used a rounded teaspoon of filling, and not a single one broke. And, you know what? The ravioli were perfect. If I do say so myself. 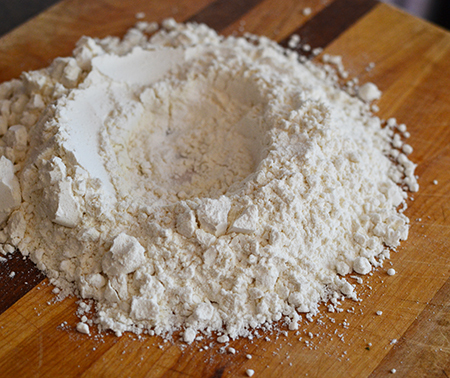 Place flour on a board and make a well. 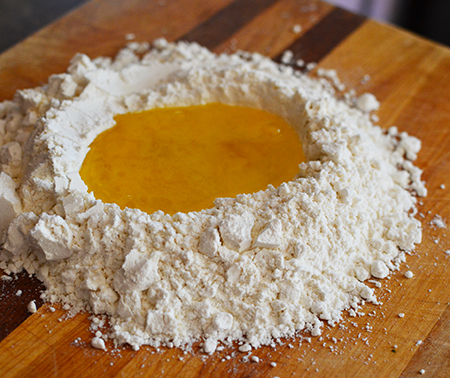 Add egg, oil, and salt; using a fork, whisk the egg and incorporate flour until it begins to come together. 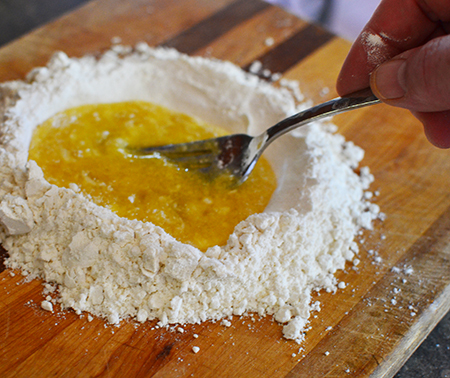 Continue mixing and kneading by hand until you have a smooth and satiny dough. Let rest for 20 minutes under a damp cloth. 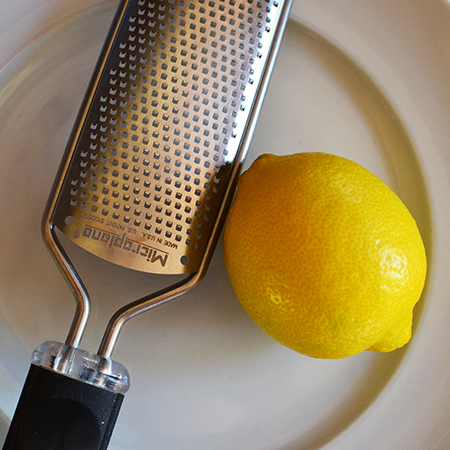 Mix the cheese, marjoram, zest, and nutmeg together and season with salt and pepper. Roll dough to the next-to-thinnest setting (No. 6 on an Atlas machine). Cut out 2 1/2-inch circles - you will need 28. Place a slightly rounded teaspoon of the cheese mixture on half the pasta pieces. Moisten the edges with water using a brush or the tip of your finger, top with the other pieces of pasta and seal as tightly as possible all the way around with dry fingers, pressing out any air bubbles. Let the filled ravioli sit for 10 minutes under a damp towel Bring a large pot of salted water to a rapid simmer (not a full boil). Gently slide the ravioli into the simmering water one at a time. Cook for 2 minutes and, using a slotted spoon, drain and place on the serving platter. Drizzle with the melted butter and stir gently to coat. Sprinkle lightly with additional chopped fresh marjoram leaves. But it is simple, Susan! But (for Michael) definitely not gluten-free! You are very clever, David! 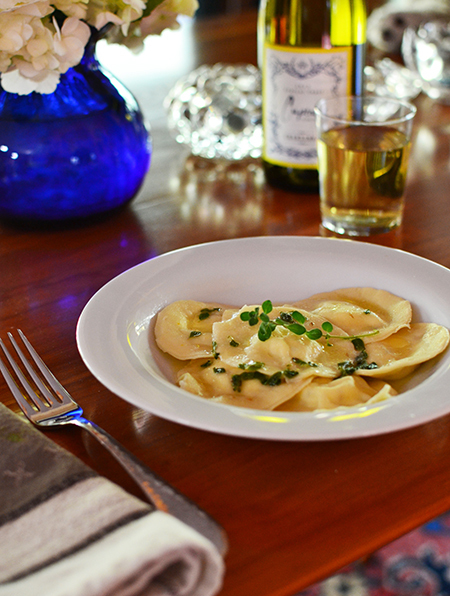 I have yet to delve into the world of filled pasta... though I think I did make some pumpkin ravioli a lifetime ago! Lovely post, thanks! Thanks, Liz - I love filling pasta. There are so many possibilities! Hear, hear! I love what you said about the ingredients and feel like a broken record (do today's generation even know what that means?) on my own site, as I just keep pushing quality, quality, quality. Sometimes I feel it falls on mostly deaf ears. So many times, people come back to me and tell me their version of my recipe, "didn't taste the same". Only to find out they substituted inferior quality ingredients! Ugh! Thanks, Christina. I know my love of the best-quality ingredients is shared by you, and many other bloggers. Perhaps someday people will listen... Maybe when we have friends to dinner, each meal should include a blind tasting of ingredients... It would be fun to have each guest understand why we make such a fuss! You can come over and make ravioli at my place anytime, David. They're so perfect - inside and out. Very kind, John, and I definitely look forward to cooking together someday, either here in Tucson or there in Sydney! LOVE lemon zest in the filling for these - everything tastes better I think. Definitely, Paola! I love the zing of the zest. Ooh.... That is a good post title! 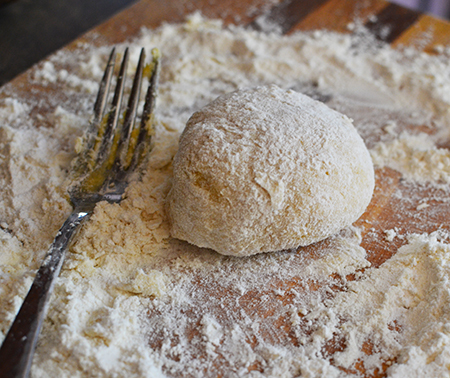 Before Atlas entered my life, Greg, I used to roll the dough by hand with a rolling pin. It can be done! And the freshly grated nutmeg! Lovely, David! Thank you for this beautiful post! Freshly grated makes such a difference, doesn't it, Susan? Glad you enjoyed the post - looking forward to your return! Ruth, I definitely think you need to send this to Young! I love that he took the class - and I hope you and Tom benefit from it often! Truly amazing! Pasta (other than my grandma's egg noodles which I do annually) has been on my must try list for far too long. Inger, I am very fortunate that our herbs - with the possible exception of basil, weather depending - make it through the winter. I love fresh marjoram - such an underrated herb! Hi David! How are you my friend? Sorry I haven't visited in aeons but work took everything out of me. I finally have a short break for the holidays somim trying to catch up with friends. 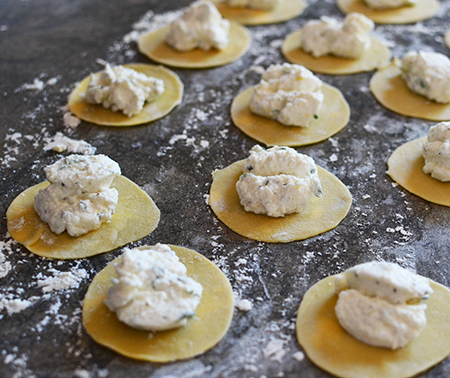 Your ravioli looks beautiful, and some great tips too. I went all summer without using even a leaf of my marjoram. The last cold snap took care of it. I have a brand new pasta machine that I bought last Black Friday and it still hasn't been opened. Fancy coming over and taking it for a roll? Nazneen - so good to hear from you! I know you are busy - but it is comforting to know that you are there even when quiet! 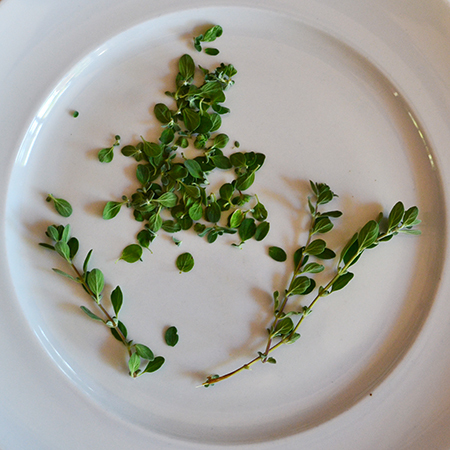 Mark loves marjoram and asks me to use it often - we are lucky to have it year-round. Someday, it would be a blast to cook together... maybe I will get to come to CO this year and we can play! In the meantime, get out that pasta machine and start playing! 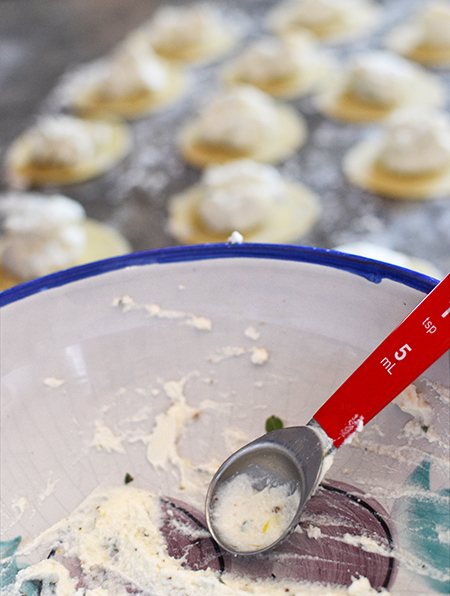 Dear David, what an elegant recipe - everything just falls into place perfectly...pasta making has a certain calming effect, especially if the end resut is as picture perfect as your beautiful Ravioli Caprese. Thanks, dear friend! I do love making pasta - there is something so tactile about it, and it does make me feel peaceful! this is a gorgeous post! Ravioli and other stuffed pasta are one of my biggest weaknesses, and yours look perfect and that filling looks ah-mazing! Thanks, Marcelle! I love making ravioli, and this is my new favorite filling! Maybe I will get some play time around the holidays to make some other new flavors! Marjoram is such a lovely herb, all too often overlooked. You definitely should, Colette! It's really tasty! Simple but elegant....looks so good. You mentioned duck confit, have you made them with duck confit? 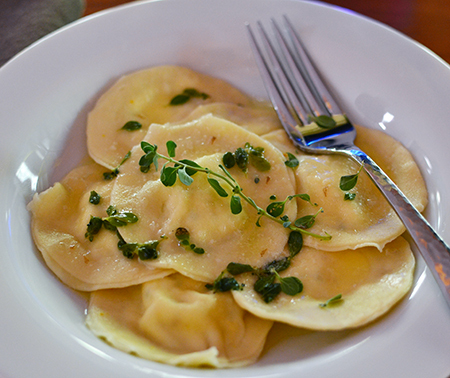 Yes, Susan - I have filled ravioli with duck confit and they are amazing. You and Towny definitely need to try them! Beautiful post, and couldn't agree more on the simplicity! Thanks, Paolo. It still amazes me when people think good food needs to be complicated. They look perfect! And the Italian in me is saying that in this case it is a good thing that the parmigiano reggiano wasn't local... because it wouldn't have been the same!